The Rab PS Zip Top is a simple Polartec Powerstretch stretchy wicking mid layer. It features a deep venting chest zip, a high collar and thumb loops allowing far greater regulation of temperature. The slim fit (very slim) and stretchy Polartec Powerstretch leaves minimal fabric spare to create a streamlined look and feel to the top. This very athletic cut makes it ideal for many activities and concomitantly the stretch fabric allows fairly unhindered movement. Although the arm lift is not absolutely perfect its good enough not to feel like a problem when climbing. The slim cuffs make it nice to climb in, but do make it difficult to pull the sleeves up for ventilation. The Rab PS Zip Top also features thumb loops which are a great addition for a little bit of extra warmth and especially so when out in winter where it allows a smoother transition inside your gloves (i.e. not leaving a cold spot around your wrists – keeping your wrists and subsequently hands far warmer). The thumb loops aren’t the most comfortable for sustained use; creating rubbing or blistering when using them intensively e.g. digging snow holes and using ice axes for multiple days. The high collar is great for trapping extra heat and is far cosier than some of the more token efforts (e.g. the collar on the Montane Oryx Jacket). The singular simple chest pocket is ideal for stashing small items, although it does run in to the armpit leading to items almost disappearing around your back. Many years ago somebody told me there were 17 different grades of Polartec Powerstrech. There are undoubtedly more nowadays and unfortunately the Rab PS Zip Top uses what feels like a relatively low quality Powerstretch. The difference may only be very subtle but it does feel less insulating, stretchy and hardwearing in comparison to some of its more expensive rivals. Whilst only anecdotal evidence another (more expensive) Polartec Powerstretch top with similar use has bobbled and worn less than the Rab PS Zip Top. Great simplistic (and lightweight) design. High collar, deep venting chest zip and thumb loops allow better temperature control. Slim fit and Polartec Powerstretch allow good movement without excess fabric. Price is excellent in comparison to most other Polartec Powerstretch tops. Not the highest quality Polartec Powerstretch. Synthetic fabric and close fit mean regular use will require regular washing. 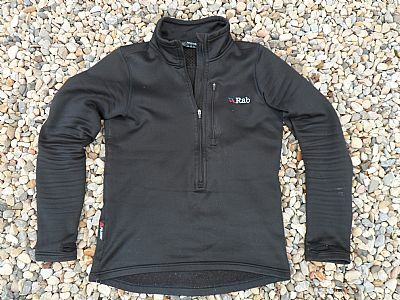 The Rab PS Zip Top is a fantastic stretchy close fitting mid layer. It sheds a small amount of wind, is highly breathable, wicks sweat well and has a well thought out practical design.